The last Tuesday before Christmas so a christmas card to wish you all a Very Happy Christmas and Prosperous New Year. I do hope my sisters are not looking as this is their card! I only posted them yesterday as I am never organised enough to have my cards made early....maybe next year! I have incorporated several techniques in this card so here goes. The card is 7x5 so I cut my gold mirri card and cream layers using spellbinders dies. This ensures that they are square. I embossed the cream card with couture creations Moonlit Berries embossing folder. I lightly coated the raised areas with Inka Gold (Gold colour) to enhance the pattern and link it in with the colour theme. Please be sure never to put your fingers in the pot always use a sponge applicator. I placed both layers using my marsupial tool which helps with positioning the layers accurately. I have an eagle eyed sister who always spots any mis alignment! Next I stamped the Deep Red Vintage Merry Christmas on to white card (I usually avoid using white on cream but think this works well giving a very clean look) and cut out with an oval die. I edged with tea die distress ink and coloured the image with alcohol inks. I then went over with clear wink of stella to give a little sparkle. I used Red stickles for the berries on the topper. I then cut out of gold mirri the largest floral oval from spellbinders dies and layered the sentiment on to this. 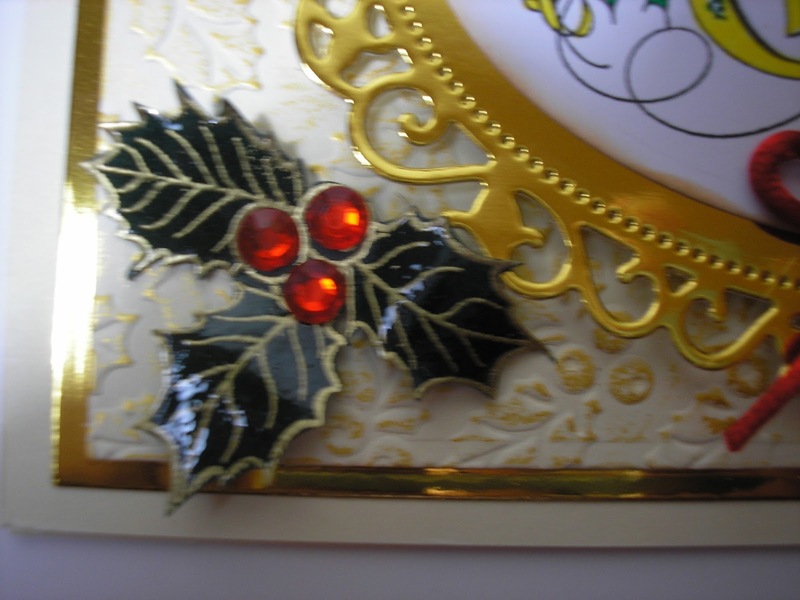 This topper was then put on to the centre of the card with pin flair glue. A small red bow completed the topper. I stamped Honey Doo Holly on to dark green paper and heat embossed with gold embossing powder. I then coated these with glossy accents to give the glossy leaf look. When this was almost dry I shaped the leaves by curling around a pencil. I finished off with Red gems and place one in each corner. Heres to a Great 2017 and I wish you all a Very Happy Christmas. A really beautiful card Janet. I particularly like the addition of the glossy accents to the holly leaves.